This attractive antique Victorian style German wall clock was purchased locally from a family that once lived in the town of Parrsboro over 100 years ago. 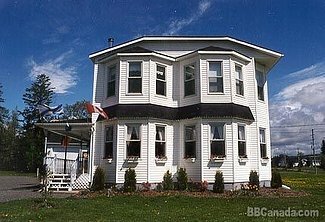 Parrsboro is a picturesque Canadian community in Cumberland County, Nova Scotia and one of the oldest settled areas of Canada. It had hung for many years in the Parrsboro Mansion pictured below. Today the mansion is a popular bed and breakfast destination. I found the clock on a local online for-sale site. It looked interesting but there was no price listed. I contacted the seller but they were asking considerably more than I was willing to pay. I explained the work that had to be done to the case and movement and the fact that had it been in better condition they would easily receive more for the clock. I concluded the phone conversation with my top offer for the clock. They contacted me 4 days later and met my price. I was curious about its history. The seller explained that the clock was brought over from Europe when her husband’s family moved to Canada in the 1890s and had been in the family ever since. The family was in the process of downsizing and this was one of the items that had to go. I was pleased that the seller expressed an interest in seeing the final restoration and I assured her that I would keep in touch. Knowing the history of the clock, or any clock for that matter, is value added in my view; provenance is so important when it comes to any antique. It is a Mauthe time and strike wall clock with an Adler gong. I have been assured that the clock is original in every way and using the serial number and trademark I have determined that it was made between 1890 and 1910, consistent with information provided by the seller. The eagle emblem on the Adler gong suggests that it was made after 1898. The turn of the century would be fairly accurate dating for this clock. It is a 120 year old clock that is not overly garish and reflects the style its period. The clock case is in need of a restoration. There are pieces missing and it appears that it was either in a hot environment for some of its life, an attic perhaps or hung over a fireplace; the finish is alligorated. Alligorated finsihes are those that have encountered heat damage and are characterized by a finish (shellac or lacquer) that softens and pools into globules collecting dirt as it re-hardens. It is missing a finial on the crown, a trim piece on the top of the access door, the wall stabilizers and a corner piece on left side of the crown. Some of these parts are available through parts suppliers, other pieces must be fabricated. I am anxious to start on the case and must decide whether to clean the surface or strip to the bare wood. The dial is a separate issue. It is cellulose and very dark. Can it be cleaned? Not likely but I am doing some research to find a solution. In the meantime the movement has run strong for the past 4 days and strikes as it should. It will need a cleaning and possibly new bushings but I will know more once I examine it more carefully. At this point I do not see any major issues with the movement. I am completing the restoration of a Waterbury wall clock and once done I will commence work on this clock project. As I proceed with this project I will document my experiences restoring this early 1900s FMS Mauthe time and strike wall clock with an interesting history. Look forward to the finished result! Thanks Robert. I am going to be starting this clock in the next couple of days. I am waiting for the movement to go through an eight day cycle to see if the mainsprings are okay and that it strikes and keeps time as it should. So far it is doing well. I have some ideas on the case and will likely start with a partial stripping to see what I have underneath the dirt and grime.